I have to admit, I am an over-thinker. I can take a perfectly normal circumstance and analyze, critique, and dissect it into all its parts until it no longer makes any sense whatsoever. And I know I am not the only one who suffers from this type of thinking. You see something, or you hear something that makes you form a question in your head. Or you go back to something that was said or done in the past, and you focus on that. Suddenly, you are entering the over-thinking zone, and you are ill-prepared. (Over-thinking will catch you off guard most times.) The mind works in curious ways. It will divert all attention to things you would rather ignore and force you to deal with something until a resolution is reached- or until you pass out and remember it in the morning. You will catch yourself saying things like, “that doesn’t make sense,” or “I wouldn’t have done that,” or even ” what does that mean?” Then comes the barrage of thoughts that hinder you from being happy. When you look at something under a microscope, you only see the detail that makes up the entirety- you don’t actually see the big picture. It’s the same with over-thinking. You only see the things that are a small part of something much bigger. When you mention the little things that trigger your over-thinking response, when you ask 100 questions in regards to why your partner went out for pizza instead of going for the usual burger joint with their friends, when you ask why it took 35 minutes to respond to your text instead of the usual immediate response- you are focusing on the trivial instead of the important. What’s important is that your partner told you they went for pizza, and they did respond to your text. It’s the “why’s” that get us caught up in our own thoughts. The “why’s” are what cause a hindrance in our relationships and in our own progression, individually. The other side of this is over-thinking about what “you may be doing wrong.” Trust me, if you are worried that you might be doing something wrong, you are probably doing everything right except worrying about what you are doing wrong. Over-thinking leads to blame – one way or the other, you or them. Stop the blame cycle! Breathe and learn to trust. Trust yourself and others. It really is the only way to move forward in your life. If you are thinking this is easier said than done, you’re right. But let’s be realistic… it’s usually easier to say something than to do it. 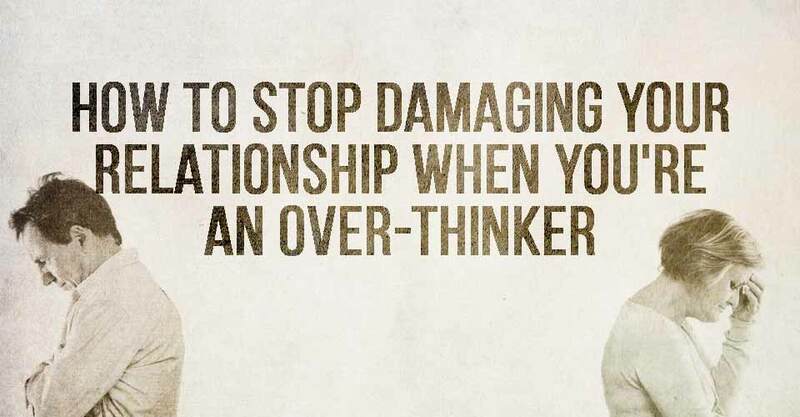 To stop the damage being done to your relationship, you must stop the over-thinking. How to stop over-thinking? Well, there is no answer that will work for everyone; I can only tell you what worked for me. These reminders will help you to curb your over-thinking and put an end to the damage being caused by it. What useful tips do you have to help with over-thinking in relationships?